I'm actually a little embarrassed to admit that I haven't spent a lot of time teaching my preschooler son all the familiar nursery rhymes. For some reason I read the rhymes more often to my daughter when she was younger. Of course, given my love of Mother Goose, we've read Mother Goose books but not repeatedly. Sometimes I sing the rhymes for my children, but we haven't really listened to many of the nursery rhyme melodies on CD or on DVD either. In my childhood I learned and memorized many nursery rhyme melodies and there's no doubt in my mind that this early exposure to nursery rhymes helped accelerate my reading and rhyming skills. 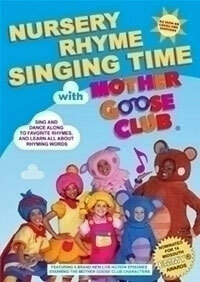 The DVD includes 15 familiar nursery rhyme songs and five Mother Goose Club episodes. 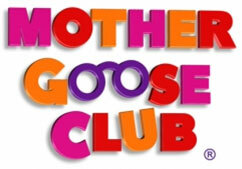 The Mother Goose Club characters are certainly zany! The six characters -- Teddy Bear, Jack B. Nimble, Little Bo Peep, Baa Baa Sheep, Mary Quite Contrary, and Eep Mouse -- are actual adults and kids dressed up in brightly colored costumes. The characters sing and dance, all the while teaching young viewers about rhyming words. The characters remind me a little of those from the Doodlebops series, a PBS show we watched for a short period when my daughter was younger. Perhaps that explains her fascination with the Mother Goose Club characters' showy wigs and costumes. Parents and educators can either pick and choose songs and episodes individually from the menu or play everything at once. If you select "play all," the DVD plays the nursery rhyme songs first and then the episodes. My preschooler son prefers the short and to the point songs and likes to sing along, especially with his favorites, "One, Two, Buckle My Shoe" and "Itsy Bitsy Spider." The episodes concentrate primarily on teaching rhyming skills using various nursery rhymes. I did notice that a few of the songs aren't what I expected. "Where is Thumbkin" is abbreviated and only covers thumbkin and pointer, neglecting the other fingers. The "Baa Baa Black Sheep" song rhyme is actually titled "Baa, Baa, Baa Sheep" and the lyrics are changed a little ("One for my teddy, one for Bo Peep, one for the little boy who lives down the street.") While the characters do read the original rhyme later on, I wish that the song was also sung using the familiar verse. Overall, I do think that Mother Goose Club provides parents, daycare providers and educators with useful tools to introduce nursery rhymes and teach kids about rhyming. My kids were singing along to the fun, upbeat tunes almost immediately. Additional products including CDs and a coloring book are available for purchase from the store on the Mother Goose Club Website. 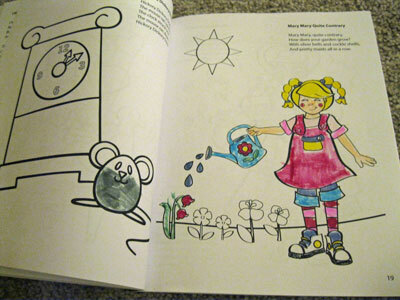 Don't miss out on the $27.00 SUMMER special for the Mother Goose Club Super Pack that includes the CDs, DVD and coloring book. Speaking of the website, I found several valuable resources there. Seriously, it is a virtual treasure trove itself! 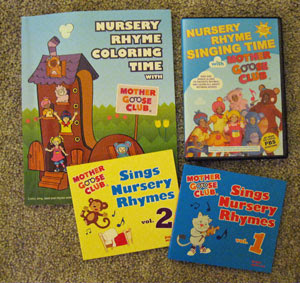 The Mother Goose Club Website contains a huge selection of nursery rhymes that kids can listen to as well as videos, printable pdfs and sheet music. At the bottom of the Parents section are tips on rhyming with preschoolers and a very nice collection of printable uppercase and lowercase alphabet practice sheets. I highly recommend this online resource. Connect with the Mother Goose Club on Facebook, YouTube and Twitter. This sounds like a great resource for parents of preschool-aged kids!